The Battle of Pharsalus took place on August 9, 48 BC and was the decisive engagement of Caesar's Civil War (49-45 BC). Some sources indicate that battle may have taken place on June 6/7 or June 29. With the war with Julius Caesar raging, Gnaeus Pompeius Magnus (Pompey) ordered the Roman Senate to flee to Greece while he raised an army in the region. With the immediate threat of Pompey removed, Caesar quickly consolidated his position in the western parts of the Republic. Defeating Pompey's forces in Spain, he shifted east and began preparing for a campaign in Greece. These efforts were hampered as Pompey's forces controlled the Republic's navy. Finally forcing a crossing that winter, Caesar was soon joined by additional troops under Mark Antony. Despite being reinforced, Caesar was still outnumbered by Pompey's army, though his men were veterans and the enemy largely new recruits. Through the summer, the two armies maneuvered against each other, with Caesar attempting to besiege Pompey at Dyrrhachium. The resulting battle saw Pompey win a victory and Caesar was forced to back away. Wary of fighting Caesar, Pompey failed to follow up this triumph, preferring instead to starve his opponent's army into submission. He was soon swayed from this course by his generals, various senators, and other influential Romans who wished him to give battle. Advancing through Thessaly, Pompey encamped his army on the slopes of Mount Dogantzes in the Enipeus Valley, approximately three and a half miles from Caesar's army. For several days the armies formed for battle each morning, however, Caesar was unwilling to attack up the slopes of the mountain. 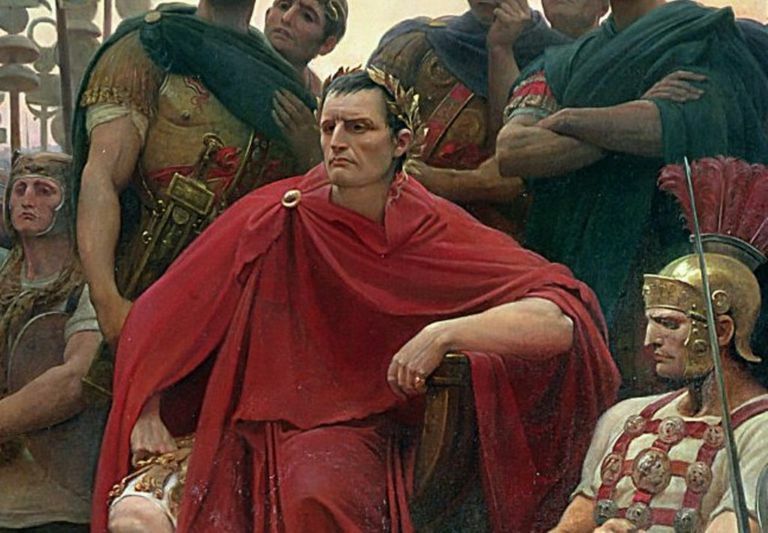 By August 8, with his food supplies low, Caesar began debating withdrawing east. Under pressure to fight, Pompey planned to give battle the next morning. Moving down into the valley, Pompey anchored his right flank on the Enipeus River and deployed his men in the traditional formation of three lines, each ten men deep. Knowing that he had a larger and better-trained cavalry force, he concentrated his horse on the left. His plan called for the infantry to remain in place, forcing Caesar's men to charge a long distance and tiring them before contact. As the infantry engaged, his cavalry would sweep Caesar's from the field before pivoting and attacking into the enemy's flank and rear. Seeing Pompey move off the mountain on August 9, Caesar deployed his smaller army to meet the threat. Anchoring his left, led by Mark Antony along the river, he too formed three lines though they were not as deep as Pompey's. Also, he held his third line in reserve. Understanding Pompey's advantage in cavalry, Caesar pulled 3,000 men from his third line and arrayed them in a diagonal line behind his cavalry to protect the army's flank. Ordering the charge, Caesar's men began advancing. Surging forward, it soon became clear that Pompey's army was standing their ground. Realizing Pompey's goal, Caesar halted his army approximately 150 yards from the enemy to rest and reform the lines. Resuming their advance, they slammed into Pompey's lines. On the flank, Titus Labienus led Pompey's cavalry forward and made progress against their counterparts. Falling back, Caesar's cavalry led Labienus' horsemen into the line of supporting infantry. Using their javelins to thrust at the enemy cavalry, Caesar's men halted the attack. Uniting with their own cavalry, they charged and drove Labienus' troops from the field. Wheeling left, this combined force of infantry and cavalry struck into Pompey's left flank. Though Caesar's first two lines were under heavy pressure from Pompey's larger army, this attack, coupled with the entry of his reserve line, swung the battle. With their flank crumbling and fresh troops assaulting their front, Pompey's men began to give way. As his army collapsed, Pompey fled the field. Seeking to deliver the deciding blow of the war, Caesar pursued Pompey's retreating army and compelled four legions to surrender the following day. The Battle of Pharsalus cost Caesar between 200 and 1,200 casualties while Pompey suffered between 6,000 and 15,000. Additionally, Caesar reported capturing 24,000, including Marcus Junius Brutus, and showed great clemency in pardoning many the Optimate leaders. His army destroyed, Pompey fled to Egypt seeking aid from King Ptolemy XIII. Shortly after arriving at Alexandria, he was murdered by the Egyptians. Pursuing his enemy to Egypt, Caesar was horrified when Ptolemy presented him with Pompey's severed head. Though Pompey had been defeated and killed, the war continued on as Optimate supporters, including the general's two sons, raised new forces in Africa and Spain. For the next few years, Caesar conducted various campaigns to eliminate this resistance. The war effectively ended in 45 BC after his victory at the Battle of Munda.